There are regular and special activities for young, old and anywhere in the middle! → For babies and small children, check out Two by Two and Dads n Kidz. → For Dads on occasional Saturdays, see Dads n Kidz. 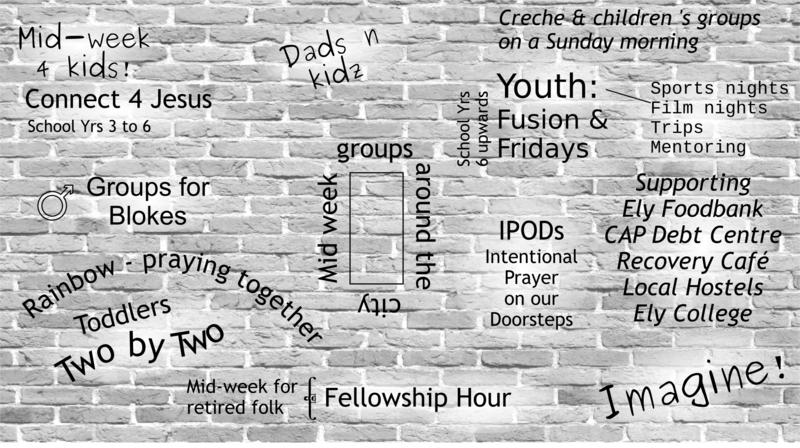 → For mid-week fellowship with mostly retired folk see Fellowship Hour. → For information about other mid-week groups that happen across the city see Small Groups. An On-Line Calender shows the activities that take place in the church building (along with other bookings). Click on the wall below to explore the different activities.